Spend an entire year of discovering God’s blessings, and develop a lifetime of gratitude. God loves everyone, and one way He shows His love is through showering us with blessings! Whether it’s with parents who love us, warm sunshine, or the ultimate blessing of His Son, Jesus, God’s love is everywhere. 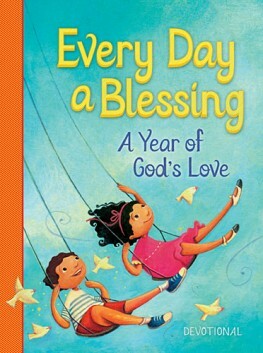 When kids see that God is the source of all blessings, it reminds them that all gifts truly do come from God. Children will learn to not only see God’s blessings in happy days, but to see His loving hand in hard days as well. Developing a habit of giving thanks in all circumstances will lead children to a lifelong spirit of gratitude. Each devotion features Scripture and a bite-sized message that will keep the attention of young minds. Devotions also have a takeaway to help children engage with the message and apply its meaning to their lives. This entry was posted in Blog by Tommy Nelson. Bookmark the permalink. SPOTTED at Books-A-Million! #WeAreTheGardeners on the Bestsellers shelf AND on the Joanna Gaines display! Use #WeAreTheGardeners to let us know where you see Joanna's picture book in the wild! LAST DAY to score Live Fearless and Finding Gobi for 50% off at the Barnes & Noble #BookHaul! Deals on books for all ages In stores and online! Don't miss it! The moon is sneaking out. There's much to think about! Author Diane Stortz Books is giving away some goodies to celebrate the release of I Am for Little Ones! Three winners will receive a signed copy of the new book. One will receive a set of all three I AM books—I AM: 40 Reasons to Trust God, the I AM Devotional, and the new book for toddlers and preschoolers. And one winner will receive a copy of the new book plus a set of 6 laminated placemats made by Shutterfly based on content from book! Head over to her site to enter for a chance to win! This Sunday evening, join Max Lucado on Jesus Calling by Sarah Young's Facebook Live as he shares how every member of your family can tackle anxiety in a tense world — spoiler: focus on gratitude!